The nominee made at least one other bit of news, saying he will veto any legislative reapportionment plan the General Assembly sends him that is not “fair” and which relies on creative cartography, more commonly known as gerrymandering. In an appearance before Crain’s editorial board, Pritzker had only harsh words for Rauner, even though polls are showing the Democrat ahead anywhere from 12 to 20 points. Those issues start by giving the state the financial resources it needs to do its job in a stable, predictable fashion, Pritzker said, blaming a decline in student population as many of the state’s colleges and universities on the three-year budget standoff in Springfield on Rauner’s watch. But Pritzker declined at least a half a dozen times when asked to define who is “wealthy.” (Rauner has charged that many middle-class families would be hit.) Instead, he said he’d negotiate terms with the General Assembly and urged the curious to take a look at graduated rates in other states. Most of them have grown their job base much faster than Illinois has, said Pritzker, who comes from the wealthy Hyatt Hotels family but built his own career as a successful tech investor. Though taxes count, “the most important thing job creators are looking for is talent,” he said, and either way, “the vast majority of taxpayers should get a tax break” under his plan. Pritzker also stuck by his plan to help lower-middle-class families by making a Medicaid buy-in available to all—the so-called public option—and insisted it would come at no net cost to Illinois taxpayers. 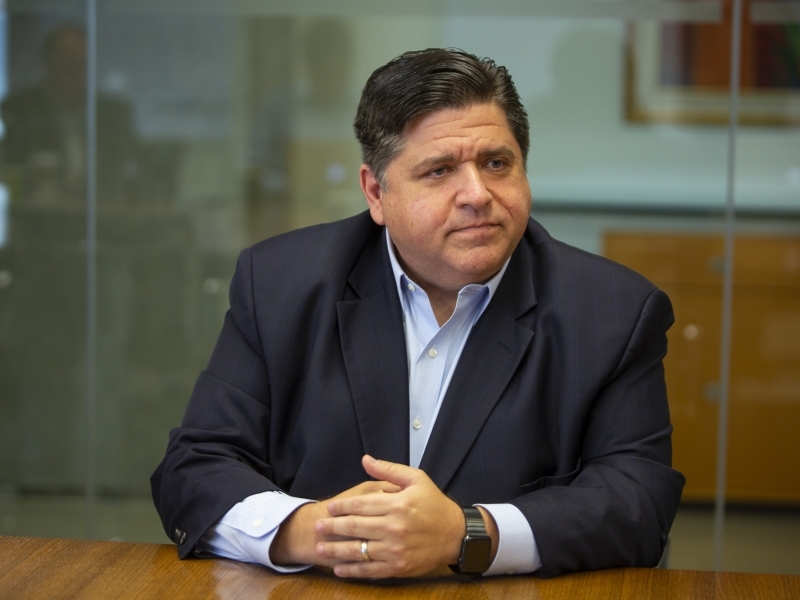 Those participating would have to pay the state’s actual cost, but that would be a lot cheaper than buying private insurance because the state would not need to make a profit, Pritzker said. But the state “might want to ask” if Obamacare subsidies from the federal government could pay part of the costs. He ruled out state bankruptcy as an option, and asked about amending the state Constitution to cut the tab replied, “I don’t think that’s a good idea.” Pritzker is interested in cutting the long-term pension tab by putting in more money now, but seemed to reject a proposed pension obligation bond issue as a solution. Pritzker did raise the possibility of some cuts in state spending. Paying the state’s bills right away instead of delaying and paying 12 percent interest makes sense. So does relying more on community-based treatment to help some drug users and mentally handicapped offenders, rather than incarcerating them. Beyond that, the state could raise “hundreds of millions” each year by legalizing the sale of cannabis to the general public and allowing internet wagering on sporting events. The Democratic nominee also appeared to signal the likely death of Rauner’s vaunted Discovery Partners Institute on Related Midwest’s 78-acre property at Roosevelt and Clark. “It should have partners in private industry,” rather than just rely on a pending state grant of up to $500 million, Pritzker said. “There is no private support as best as I can tell,” despite several months of promises from Rauner, who told Crain’s that investors are willing to step forward if he is re-elected. As a matter of practical politics, the DPI plan was the creation of Rauner and Chicago Mayor Rahm Emanuel. Rauner soon could be out of office and Emanuel will retire after his current term ends in April.